I’ve been making a late-December wine trip with a few friends to Napa and Sonoma for a number of years, and the end of 2016 was no exception. It’s always more fun when we’ve been able to stay at one of my friends’ timeshare units in Windsor, just north of Santa Rosa. This provides a convenient and comfortable base and allows us to enjoy breakfasts and dinners together in a relaxed setting. None of our group had enough time to spare over the holidays for an extended stay there, but we were able to gather for a couple of nights – including New Year’s Eve – and to head out for a day of wine-tasting on the last day of the year. Friends Jane, Dean, Pam, and Jeff joined in for this brief visit to two vineyard and winery destinations. I drove Jane and Dean from Windsor, while Pam and Jeff met us along the way. Heading out from Windsor on a cold and overcast morning, we followed Highway 12 southeast from Santa Rosa and toward Sonoma Valley before turning off onto the winding road of Trinity Grade and up into the Mayacamas Mountains. It’s a slow but scenic route, and we eventually made it over the crest of the mountains and into Napa County, then continued our drive on the slopes of Mount Veeder along Dry Creek Road to our first appointment of the day. Lagier Meredith 2014 Syrah, Mount Veeder, Napa Valley. Medium-dark purple, featuring beautiful floral notes along with raspberry, plum, and darker berry aromas, plus touches of earth, spice, and black pepper. Medium-bodied, with fine depth and acidity on the palate, finishing with fine tannins – very approachable already and it should develop nicely with cellaring as well. Probably the most aromatic young Lagier Meredith Syrah I’ve tried in some years. Jane, Dean, and I arrived at the base of the road leading up to Lagier Meredith right on time, and Pam and Jeff joined us there just moments later. They followed us as we made our way along the steep and narrow road through the trees and up the hillside to the ridgeline of Mount Veeder, where Lagier Meredith Vineyard is located. On a clear day, the views from there are spectacular across Napa Valley to the east and as far as the Berkeley Hills across San Pablo Bay to the southwest, but unfortunately that morning was anything but clear. We’d barely gotten out of our cars when Steve Lagier appeared and welcomed us up the stairs to their hilltop house. When the weather there has been nice, we’ve sat out on the deck with Carole Meredith and Steve, but it was a cold morning – less than 40 degrees – and we were more than happy to accept Steve and Carole’s invitation to head inside. Carole mentioned that it was about 15 degrees colder that morning than it had been just the day before. From inside the house, we could see that the cold weather wasn’t stopping the constant activity of hummingbirds at the many feeders Steve and Carole have hanging from the underside of their roof. Meanwhile, Pearl the cat was far more interested in warming herself in front of the wood-burning stove than in greeting the newly-arrived visitors. I’ve written about Lagier Meredith a number of times, but it’s still worth a brief introduction to Steve and Carole and to their vineyard and wines. Both have backgrounds at UC Davis, which is where they met. Steve earned a degree in biochemistry followed by a master’s degree in enology, and he went on to work as a winemaker at Robert Mondavi Winery for nearly 15 years. Carole earned a doctorate in plant genetics at Davis before joining the faculty at the Department of Viticulture and Enology. She’s famed for her pioneering work on grapevine DNA, particularly with respect to discovering the Croatian origins of the Zinfandel grape variety. Steve and Carole purchased their property on Mount Veeder in 1986. The site has mostly fractured sandstone and shale rock and soil, the seabed materials common on Mount Veeder but unusual in most of Napa Valley. They told us that much of the water below their vineyard is trapped in “closed fractures” of the rock, which traps it in place. This has helped get Steve and Carole’s vines through the recent dry years in California with minimal problem. They planted their first Syrah vines on the property in 1994 – the first plantings were Durell clone, and they added more clones later – 174, 383, 470, 525, and 877. The vineyard is only 4½ acres in size, so Steve and Carole are able to do nearly all the work there themselves. They mentioned that the soil at their ridgetop site is shallow and naturally helps control the yield of their vines. For many years Syrah was the only variety they grew there, but in 2007 they added a block of Mondeuse, and in 2010 they grafted over some Syrah vines to Malbec and Zinfandel. The first commercial Lagier Meredith release was their 1998 Syrah. While Syrah remains the backbone of their small production (along with small amounts of Syrah Rosé in most years), they’ve added Mondeuse, Malbec, Zinfandel (called “Tribidrag” – a very old Croatian name for the variety), and occasionally a Syrah dessert wine called “Precious Bane.” All of the Lagier Meredith wines are made exclusively from their estate vineyard fruit. For a number of years, Steve and Carole also teamed up with their friends and neighbors Aaron and Claire Pott on wines under the Chester’s Anvil label, but they’ve recently decided to discontinue that label so everyone can focus more on their own brands. 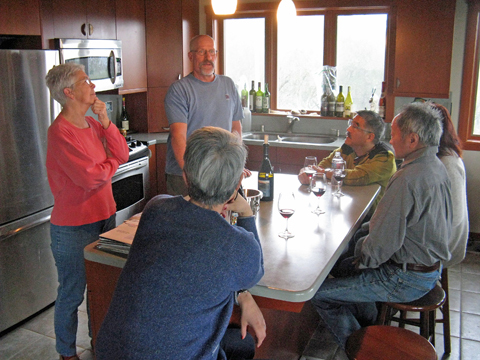 Steve and Carole opened a bottle of their new 2014 Syrah for us as we sat around their kitchen table. All of the fruit for the Lagier Meredith Syrahs is destemmed before being fermented in small bins, and the wine is aged in neutral French oak for 22 months before bottling. The program is nearly identical for their Mondeuse, Malbec, and Tribidrag, except that the Tribidrag is in barrel for a few months less than the other varieties. The Lagier Meredith Syrah nearly always has beautiful aromatics, and I thought that the 2014 showed that character even more than most vintages. Although their Syrahs often drink well when young, they also have a track record of aging extremely well. Talking with Steve and Carole is always fun, and we ventured into a variety of subjects, most of them unrelated to wine. And as usual, we enjoyed some tasty olives from the old olive trees near their house plus almonds from Steve’s family’s farm in the San Joaquin Valley. I did ask Steve and Carole about their 2016 harvest, and happily it was back to a more typical crop after the very small crop in 2015. That’s good news all around, and means among other things that there will be a Lagier Meredith Syrah Rosé from 2016 after none from the tiny 2015 vintage. I look forward to visiting Steve and Carole at their Mount Veeder vineyard and home every year. As I’ve mentioned before, they’re two of the nicest people I’ve met in the world of wine, and in addition to their hospitality, they’ve always been generous in sharing their knowledge and opinions – Steve in particular is not shy about sharing his opinions! On top of all that it almost seems a bonus that they produce one of California’s finest and most consistent Syrahs, and they do a terrific job with their other wines as well. They’ve been strong boosters over the years of wine made from fruit grown in the Mount Veeder AVA – I need to get to one of their appellation tastings one of these days! 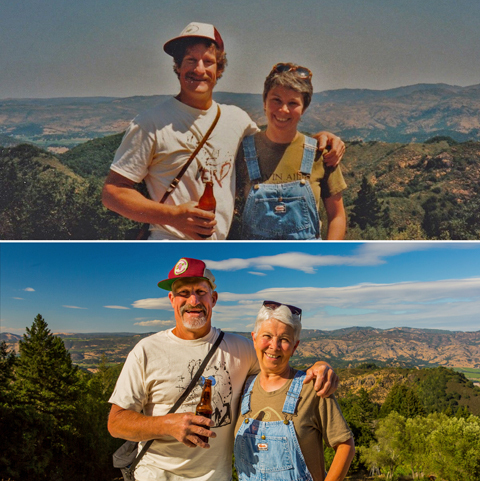 During our visit with Steve and Carole, they showed us a pair of photos of them at their Mount Veeder property – one taken the year they purchased the land in 1986 and the other taken thirty years later in 2016. I’m looking forward to the next photo from 2046! We headed back down the hill from Lagier Meredith and drove back across the mountains to Sonoma County. Jane had picked the spot for our lunch that day – Pullman Kitchen in the historic Railroad Square area of downtown Santa Rosa. When we arrived, we recognized the space as being that of the old Syrah Bistro, which several of us had been to in the past. Pullman Kitchen is an informal café, and we were able to take advantage of their nice weekend brunch menu. We enjoyed a relaxed and pleasant meal there, and although the food didn’t “wow” me, it was good enough that I’d happily return there, especially given its convenient location. Fogline 2014 Chardonnay, Zephyr’s Block, Estate, Sonoma Coast. Light straw color, with pear, lemon, earth, and spice aromas, with a light touch of vanilla/oak. Medium weight on the palate with vibrant acidity and a long finish – delicious now and should be a good candidate for cellaring too. Fogline 2015, Flora, Spring Hills Vineyard, Russian River Valley. Medium-light color, this showed lychee and spice aromas not unlike Gewürztraminer. Medium-bodied and dry, with a slightly bitter touch on the finish – another Gewürz similarity. Fogline 2015 Rosé of Zinfandel, Mattei Road Vineyard, Fountain Grove District. Light salmon/pink color, displaying lots of herbs on the nose along with flowers and red fruit. Medium-light weight with a bright texture and finish, quite pleasant. Fogline 2013 Pinot Noir, Floodgate Vineyard, Russian River Valley. Medium ruby color, this had plenty of black cherry fruit plus undertones of spice, flowers, and vanilla/oak. Smooth but lively mouthfeel with milder tannins on the finish. Fogline 2013 Pinot Noir, Hillside Block, Estate, Sonoma Coast. Slightly lighter color, with bright cherry, tea leaf, orangepeel, and earth aromas. Medium-bodied with great acidity and more structure than the previous wine, finishing with refined tannins, very nice. Fogline 2013 Pinot Noir, “Fogline Neighbors,” Sonoma Coast. Medium-light ruby color, featuring a more earthy and savory character along with black cherry fruit, tea leaf, and spice on the nose. Bright and structured on the palate, with a stony mineral note on the finish, nice. Fogline 2014 Pinot Noir, “Bacchus,” Sonoma Coast. Medium color, this featured more herbal aromas along with cherry, earth, and spice notes. The most structured of the four Pinots, with a moderately grippy finish that could use some bottle age to smooth out. Fogline 2014 Zinfandel, Grist Vineyard, Dry Creek Valley. Medium purple color, showing intense ripe berry fruit, spice, and a touch of sweet oak. Medium-bodied with good structure and a moderately tannic finish, nice. Fogline 2014 “Old Vine” Zinfandel, Mattei Road Vineyard, Fountaingrove District. Medium purple, with intense ripe boysenberry, spice, and chocolate aromas. Moderately rich on the palate, with a long, sweet finish. After our lunch, we got back in our cars for the short drive north to our afternoon appointment at Fogline Vineyards. I’d heard about Fogline for a few years but had only tasted their wines for the first time a couple of months earlier, at the Petaluma Gap Wind to Wine Festival. I was impressed with the wines and thought this would be an ideal opportunity for a visit. 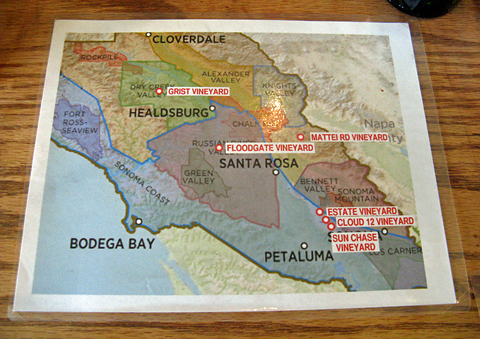 Located along River Road only about ½ mile west of Highway 101, the Fogline winery and tasting room was easy to find. We parked right outside the barn-like building and walked in, where the tasting room was hopping. 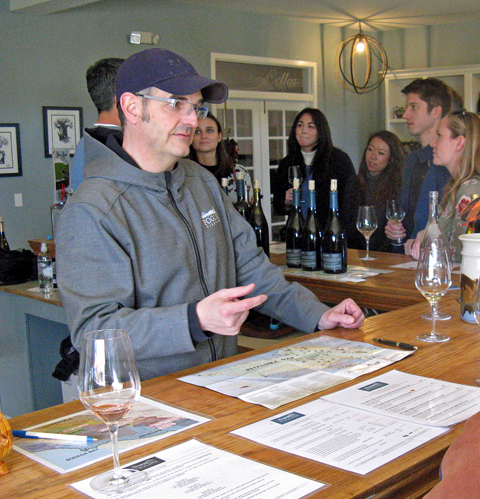 As we discovered, many winery tasting rooms close early for New Year’s Eve, and since Fogline remained open that afternoon, it attracted plenty of visitors. We were welcomed by winery co-proprietor Evan Pontoriero, who was busy along with one assistant tending to a couple of groups of tasters. We were able to squeeze in at one end of the L-shaped bar, where we began tasting some of Fogline’s current releases while learning more about the winery from Evan. 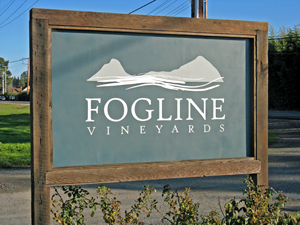 Fogline Vineyards is a partnership between Evan and his friend Brent Bessire. Evan grew up in Pennsylvania, and as is the case in many Italian-American families, he remembers his grandfather making wine at home. He moved to the Bay Area in the early 1990s, where he pursued a successful career in film animation and visual effects, working for such studios as Lucasfilm, Industrial Light and Magic, and Pixar. Evan mentioned to us that Ratatouille was a particular favorite among the films he worked on. During his early years in the film business, a friend introduced him to home winemaking and his interest in wine began to take off, with Zinfandel and Pinot Noir being among his favorite varieties. Evan eventually befriended Brent, whom he’d met at several wine events. As with Evan, Brent left another successful career to pursue his interest in wine, and he worked for noted Sonoma County producers such as Gary Farrell and Mauritson. By 2007, the two decided it was time to start their own wine venture, and they began planting Pinot Noir vines on land that Brent owned, high on the western slopes of Sonoma Mountain. The first wines were produced in 2009. Pinot Noir takes up much of the Fogline production, but they also make Zinfandel, Chardonnay, Rosé, and Syrah, plus an unusual white variety called Flora. Fogline currently makes about 1,200-1,500 cases per year, and Evan expects their production will eventually top out at about double that amount. Evan told us that his wife came up with the Fogline name, as most of the vineyards that Evan and Brent source fruit from are located above the fogline – those on Sonoma Mountain as well as from Bradford Mountain and Rockpile above Dry Creek Valley. Early vintages were made at Punchdown Cellars custom crush in Santa Rosa and at Cruse Wine Company in Petaluma, before moving to their current facility in mid-2014. Their building has an interesting history – constructed as a winery for Fulton Valley Cellars in 1984, several well-known vintners made wine there, including Joseph Swan’s Rod Burglund, Porter Creek’s George Davis, and Mueller Wines’ Bob Mueller. The upper floor once housed the offices of the Russian River Valley Winegrowers Association. The Kunde family owned the property for some time and their Sonoma Grapevines business used the adjacent vineyard to propagate budwood for many in the region. In more recent years it was owned by Robert Mondavi Winery and it’s now owned by a nearby church. Since leasing the facility, Fogline has added picnic tables and a bocce court just outside the tasting room. While the winery itself is in Russian River Valley, Fogline is best-known for its Pinot Noir from the Sonoma Coast’s Petaluma Gap region. Wines from the Petaluma Gap have been gaining increasing notice among wine critics and consumers, and the area is expected to be approved for its own AVA soon. Fogline buys fruit from several vineyards on Sonoma Mountain, at the northeastern edge of Petaluma Gap, in addition to using its estate fruit. Evan and Brent look for sustainable and organic vineyards to work with, and other nearby Sonoma Mountain grape sources have included Sun Chase, Cloud 12, and Janian. Evan feels that the higher-elevation vineyards from this area – from 900 to 1,600-foot elevation – are ideal for Pinot Noir, with more advantageous sun exposure and less mold pressure than vineyards below the fogline. The 4½-acre estate site, located directly above well-known Gap’s Crown Vineyard, is planted mostly to Pommard and 115 clones plus Swan and Mount Eden selections of Pinot, along with some Chardonnay and a tiny amount of Sauvignon Blanc. Evan is a strong proponent of “California Heritage” Pinot clones and selections vs. Dijon clones, as he feels they are better-suited to ripening here with lower sugar – and resulting alcohol – levels and are better-adapted to late summer and early fall heat spikes. We started our tasting with Fogline’s 2014 Chardonnay, sourced from Old Wente and 76 clones at the estate vineyard’s Zephyr’s Block. There’s only about one acre of Chardonnay at the site, so they don’t make a lot of this wine. The fruit was whole-cluster pressed, then barrel-fermented in new French oak before being racked into used barrels after just two months. The wine went mostly through malolactic fermentation, using a malolactic bacteria strain that minimizes production of diacetyl, which gives many Chards their “buttery” character, and biogenic amines, which are thought to contribute to wine headaches. The Chardonnay was a favorite of mine at the Petaluma Gap Wind to Wine Festival and I enjoyed it just as much on this occasion. We moved on to another white, the 2015 Flora, sourced from a single vineyard row near the tasting room. The Flora grape is a cross between Gewürztraminer and Sémillon – this was my first experience with the variety, and it was certainly distinctive, showing its Gewürz heritage in the wine’s aromatic character. Next up was the 2015 Rosé of Zinfandel. Evan told us that they’ve made Rosé from several different varieties, including Pinot Noir and Syrah (which they’re making from the 2016 vintage). The Rosé is made in a Vin Gris style, picked early and vinified for Rosé right from the start. With the tasting room becoming increasingly crowded with newly-arrived visitors, Evan suggested that we walk back into the winery portion of the building. He grabbed a few bottles of Pinot Noir and led us through a set of double doors and into the winery space. It’s a good-sized open area that looks like it will accommodate room for Fogline to grow. Evan showed off his most prized piece of winery equipment, a RotoVib destemmer that he told us is very gentle on the fruit, leaving whole berries and removing stems and jacks very effectively. He said he’d worked with one when he and Brent made their wine at Michael Cruse’s facility and realized they needed to get one for their own winery. Some reds are fermented partly with whole clusters, and they’re made in open-top fermenters. Evan told us that favorite coopers include François Frères, Remond, and Saury. Evan poured us the first of several Pinots that he wanted us to try, the 2013 from Floodgate Vineyard in Russian River Valley. The vineyard, located along the Middle Reach of the Russian River – an area famed for its Pinot Noir – has been renamed Starscape following a recent change of ownership. Made from 115, 667, 777, and Pommard Pinot clones, Evan feels the fruit from this site lends itself to a Volnay-style wine. Our next wine was the 2013 Pinot from the estate Hillside Block, made from Mount Eden, Swan, Pommard, and 115 clones. Evan noted that their estate Pinot vines produce very small clusters with relatively thick skin for the variety, something I’ve also heard from other growers in the cool and windy Petaluma Gap region. Evan told us that the 2013 Pinots are just starting to show well, and have needed more time to develop than the more forward 2014 wines. 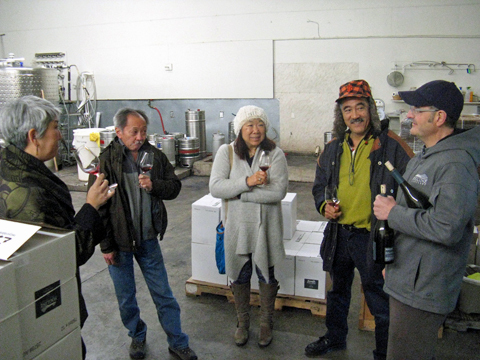 He said that he has not been overly concerned with the Fogline Pinots being ready right at release, though, and that they’re meant more for aging than for drinking right away. The 2013 Hillside Block Pinot was a standout that should develop very well with more cellaring. We tasted one more 2013 Pinot, the “Fogline Neighbors” bottling, sourced from the estate vineyard plus nearby Sun Chase and Janian vineyards. This was fermented using 30% whole clusters, and includes Mount Eden, Pommard, 114, 115, 667, and 777 clones – another Pinot that should age nicely. As we were getting ready to head back into the tasting room, Evan pointed out some barrels of their 2016 wines. Fogline got some Zinfandel last year from a new source for them, in the rugged Rockpile appellation just north of Dry Creek Valley. They also got some Syrah fruit from Cloud 12 Vineyard, not far from the Fogline estate site. Evan told us that they tried a little co-fermentation with Syrah and Ehrenfelser (a cross between Riesling and Silvaner) – sounds like an interesting experiment! Back in the tasting room, Evan poured us a taste of the first of Fogline’s 2014 Pinots to be released, the “Bacchus” bottling. This includes 50% destemmed fruit from the estate site and 50% whole-cluster fermented fruit from Janian Vineyard. We finished up our tasting with two 2014 Zinfandels. The first was from Grist Vineyard in Dry Creek Valley – this wine includes small amounts of Syrah and Petite Sirah. The final wine was a Zin from Mattei Road Vineyard, a site with volcanic soil in the Fountaingrove District northeast of Santa Rosa. Approved in 2015, the Fountaingrove District AVA is just east of Russian River Valley, and bounded by Chalk Hill and Knights Valley on the north and by Sonoma Valley on the south. Something of a nod to the big “late harvest” Zinfandels of years past, this featured higher alcohol as well as noticeable residual sugar – a tasty way to conclude our visit. Evan noted that the winery will probably join the well-known Wine Road organization in 2017 (covering Russian River, Dry Creek, and Alexander valleys), so look for them to start participating in the Wine Road events before too long. Fogline is already strongly associated with the Petaluma Gap Winegrowers Alliance, and Evan is looking forward to being one of the featured vintners on a March 2017 Rhône River cruise sponsored by the organization. We had a great time visiting with Evan at Fogline – he was an energetic and engaging host. It wasn’t easy for him to break away from their busy tasting room so we really appreciated his time in doing that. The Pinot Noirs are the stars at Fogline, although their Chardonnay is also impressive and the Zinfandels are quite good as well. I’ve noticed over the years that a number of Sonoma County producers excel at both Pinot and Zin – Williams Selyem and Scherrer among them – and it’s good to see another winery doing the same thing. In general, I’d describe the Fogline Pinot style as taking a middle path between leaner, edgier wines and bolder, lusher ones, though there is a range of distinctions between the winery’s various Pinot bottlings. Along with the 2014 Zephyr’s Block Estate Chardonnay, my favorites of the tasting were the 2013 Hillside Block Estate Pinot and 2013 “Fogline Neighbors” Pinot. With plenty of noteworthy wines and a very convenient tasting room location, Fogline is an easy choice for a winery stop when visiting Russian River Valley. After our visit to Fogline, we all made the short drive back to Windsor where we starting preparing New Year’s Eve dinner. We still had time to finish a tough jigsaw puzzle of a Wayne Thiebaud painting before midnight. Limiting ourselves to just two wine appointments helped to make it a pleasant and relaxing day, even with the drive over the mountains to Napa and back. Our year-end visit to Lagier Meredith has become an annual tradition, and it was great to check out Fogline this year as well – a newer and very promising producer. As always, thanks to everyone that we visited for being so generous with their time and their wine!